This week we have some controversial topics, such as a World First kill and a pseudo challenge for a hunter tame of old. Let’s get started, then! Check out our Patch 7.1.5 Survival Guide here! The first World First of Cataclysm happened on this day! <Paragon> was the first guild in the world to kill Nefarian, in Blackwing Descent. This kill was somewhat controversial back in the day as it sparked the first debates on class stacking. Paragon brought 11 Feral Druids to the kill, as their Rip ability would scale exponentially with the encounter’s mechanics. This debate continued through the expansion, especially in Dragon Soul. and is still relevant to high-end guilds to this day. Check out the video for the kill below! The Hunter community was in uproar on this day, after the removal of the Grimtotem Spirit Guide as a tamable pet. This spirit wolf was considered a challenge to tame, as it was a mob spawn from Grimtotem Spirit-Shifters in Dustwallow Marsh. These wolves would only stay active for 7.5 seconds before despawning, so using items like Drums of Battle, Mystical Skyfire Diamond, Heroism/Bloodlust and a Priest to Mind Control the mob when you’re ready were vital for the process. The controversy also happened because of that, while Blizzard thought that the spirit wolf didn’t fit into the Hunter class fantasy, they kept the tamable version in the game, only to go back on their decision and remove it shortly after. The mob summoned by Spirit-Shifters was replaced by Grimtotem Spirit Wolf, which were not tamable. However, Hunters who got to tame this beauty were allowed to keep them. 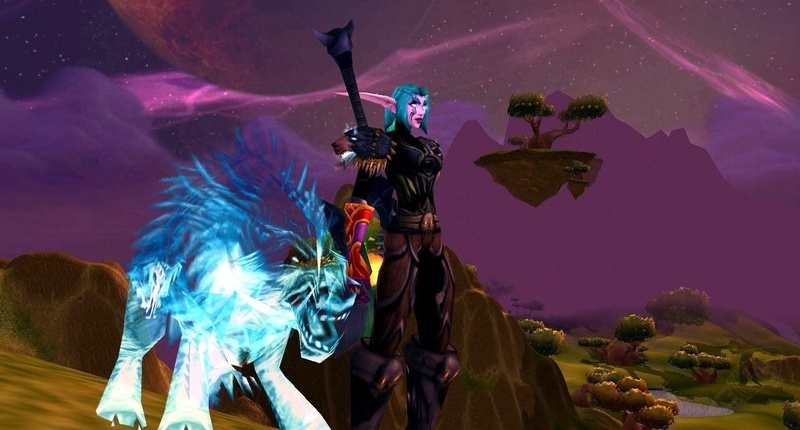 The issue of spirit creatures being tamable by hunters was solved at the released of the Wrath of the Lich King pre-patch, with the implementation of the Spirit Beast family of pets. The appearance of the Grimtotem Spirit Guide also became tamable again during Cataclysm, with the rare mob Karoma, the Wolf Spirit. Blizzard released a tool to track the Ahn’Qiraj War Effort! With this nifty tool on their website, people on their servers could keep track of the resource gathering on real time, and plan what to farm to speed up the process. This also kept track of server standings and ended up creating competition between the servers Medivh and Mannoroth, who were first and second in the standings. The competition culminated in people creating alts on their rival servers to attempt to crash them from overpopulation. Ultimately, Medivh became the victor of the battle. You can check out an archived version of the War Effort Tracker here! … 2003? Have we really gone that far? In one of the earliest snapshots of the old WoW website, Blizzard gave us preview on a few zones: Duskwood, Stranglethorn Vale, Westfall and Elwynn Forest! Blizzard also released a world map with where all these zones are marked, but… have you noticed how there is no Kalimdor? Kalimdor wasn’t even complete at this stage in development! Kalimdor would be announced later in the development cycle. Orcs and Tauren were already announced as playable races, and Durotar/Thunder Bluff were already shown to be their starter zones, so it was already under construction. I was on Aerie Peak during the War Effort, and I actually used the event as a way to boost all my non-human reputations. I was pretty close to Gnomeregan exalted at the end of it! Are you a Hunter that managed to tame the old Grimtotem Spirit Guide? Or do you have any additional War Effort stories? I’ve written a full compilation of the War Effort event on my most recent Classic Spotlight post. Tells us your stories and see you next week!